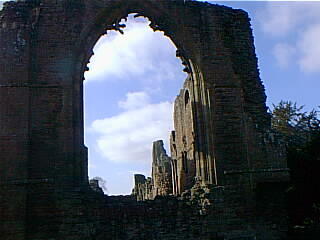 Two abbeys remain in ruins as far apart in Telford as one can get. 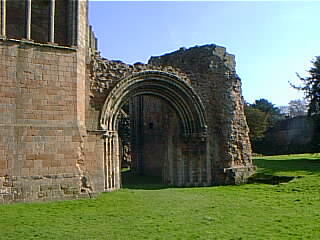 A third, Wombridge Priory, has entirely disappeared. 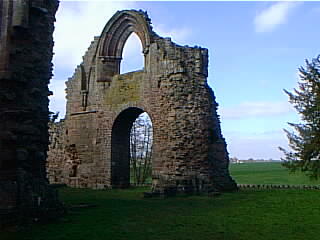 Lilleshall Abbey was an Augustinian abbey of the 12th-13th centuries, which ended its life as a Royalist stronghold in the Civil War. 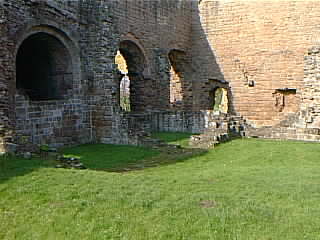 The North Side One of the bays of the north side of the nave is almost intact, and shows the height and fine proportions of the building, and also stages in its building: round Norman arch below, pointed Early English above. 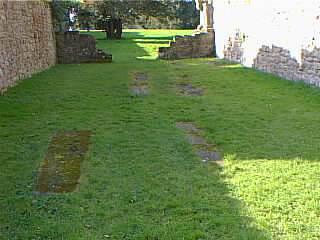 Gavin Watson again: There may have been a chapel opening off the westernmost bay of the nave. Pevsner describes the EE window above the entrance as "inexplicably sumptuous". 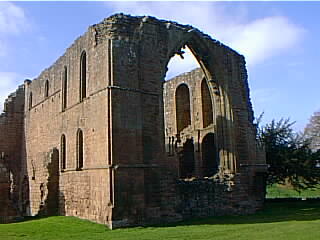 It's most unlikely that that pattern was repeated throughout the whole nave - if there was money about for a rebuilding on that scale, it would almost certainly have been spent on the chancel, which at Lilleshall remains entirely Norman. Chapels There were two chapels in the south transept; the apparent third one to the left of the photo is a separate room - I thought perhaps the Chapter House? 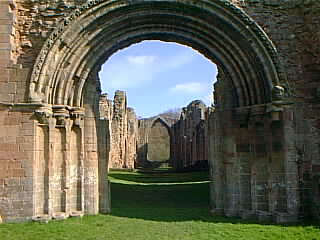 But Gavin Watson told me that As Pevsner says in his 1958 description of the site, "The E range has not the normal arrangement of rooms....The first room may have originally belonged to the transept; for it opened to the E in an arch as large as those of the transept chapels. Then follows the slype with a doorway with one order of shafts and a tympanum on a segmental lintel. Inside, vault in two ribbed bays. The ribs are of different mouldings. 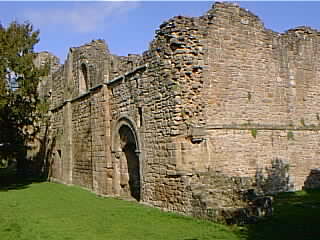 After that the former Chapter House. A window to the W can still be recognised, but the room is open to the skies." I think you were standing in the slype when you took your photograph, with your back to the chapter house. Interior There is a range of fine buildings south of the cloister, which were closed and sealed when I visited (unsafe? 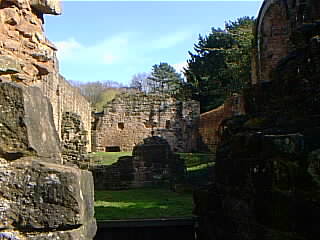 ): they, Gavin says, were the refectory range, though it included other rooms as well, probably including at least one kitchen. 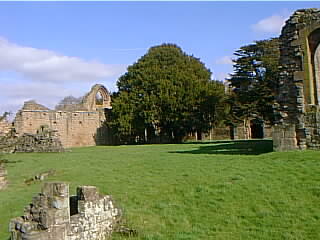 This abbey is an Ancient Monument in the care of English Heritage, but it is no longer manned as admission is free, and no information was available on the day of my visit. I hope to add a better account of the layout and history to this page at a later date. 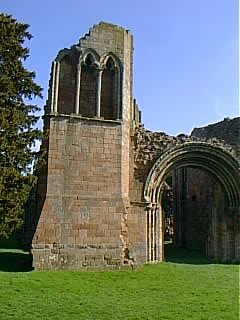 Gavin: The last abbot of Lilleshall, John Cockerel, was ... a fairly serious chap, and Henry VIII had him executed for his pains. At the dissolution in 1538/9 there were 12 canons, precisely the number of the original foundation in 1143. Lilleshall does not seem to have been among the decayed houses of lax manners.